Today is a beautiful 70 degrees. The sun is shining, the birds are singing, and life is good. This weekend is forecasted to be just as nice here in Virginia. If you’re also getting some awesome weather now, or soon, how about getting the family together and doing something fun? Maybe even involve the whole neighborhood for some great times and make some fabulous memories. Here’s a list of some fun activities that both parents and kids will enjoy, and that are easy to pull together! You won’t need to do tons of planning or coordinating, just get out and do it! There are tons of lists you can print out from the internet to get your scavenger hunt started. This is a great way to get the whole family outside in the warmer months. Go to the park and bring a list of things that can be found there, such as a bird’s feather, a certain shape or color of rock, a 3 leaf clover, etc. Make sure each child has an adult partner, and try to spread out so you can incorporate some exercise too! A scavenger hunt at the zoo is always a lot of fun and educational too! On the scavenger hunt list, add some space for each animal where you have to write down a fact about that animal. Monkeys, elephants, lions, oh my! Find them all! 2. Put nice cards in neighbor’s mailboxes – summertime secret Santa! I love doing this with my daughter and her friends. We spend about an hour making homemade cards that say happy things: Hope you have a great day! Go out and enjoy yourself today! Take a minute and relax today! …etc. The cards are simple. We just use regular copy paper from my printer, markers, crayons, whatever crafty stuff we already have at home. The kids really enjoy themselves making the cards. Then, we go out into our neighborhood and put a card in different neighbor’s mailboxes! We always sign with something like “From your neighbors”. I keep it anonymous, but you can always sign the cards if you want. I would stick to just first names, and maybe just the street you live on. I don’t know why, but I wouldn’t feel comfortable putting too much information on the cards (like house numbers and last names). Perhaps target neighbors that have kids the same age. Those parents and children will really appreciate the cards. Perhaps they will start giving out cards too! If you know the neighbors, and feel comfortable with it, you can use this opportunity to ask for a play date – maybe make more cards on the play date! Even the simplest cards can make someone's day! 3. Go camping… in your backyard! Ok, I admit that I cheat a little here. I set up our tent on our back deck, so it’s off the ground. But, still, it’s camping in the backyard and kids love doing this. Tell stories, take turns reading a book, do mad libs, make it real bonding time for your family. Pull out the bean bag chairs and make it super comfy in the tent! 4. Plant a teeny tiny garden! You don’t have to have a green thumb or tons of space to plant a little garden together. Make it quick and painless. Choose a small piece of land in the yard, remove the grass, and plant a few seeds – sunflowers are easy and are always a hit with kids. It can be as small as a square foot somewhere that gets plenty of sun. The idea is to get outside and plant something with your kids that they can watch grow during the summer months. Even if it’s one sunflower, even if it’s in a pot on the deck, it doesn’t matter. I promise you that your children will be excited to check it every day. Make a journal for them and help them record growth, how the plant is changing, what bugs they notice, etc. Teaching kids to observe nature is a fantastic summertime activity. And at the end of the summer, they will have a huge sunflower head full of seeds that you can use to make a craft (like birdseed pinecones to feed the birds in the winter months). Even getting the seeds off the sunflower head can be a fun activity to end the summer with! Grow sunflowers to harvest seeds later - fun and educational all summer long. 5. Make activity stations in the yard! This is tons of fun! Don't stress over making a bunch of fancy activities. Get the hoola hoop, make a course where you run with an egg balanced in a spoon, have sack race station with old pillow cases, put out jump ropes, etc. Add waterworks like a sprinkler, or baby pool, or slip and slide. Make your own slip and slide with a tarp and sprinkler. Use multiple tarps overlapping each other to make a super long slide. I use an inflatable snow tube for sledding so the kids can race down the slip and slide easier. The handles on the tube are great for this. Snow tubes with handles are great for slip and slide rides. If you have a couple of trees close together, wrap string between them and make a spider web obstacle activity. Just make sure your kids are agile enough to do this without falling on their faces! String between trees make a fun spider web activity. Invite the neighborhood kids over and give out prizes like popsicles or even small change (money is always a welcomed prize at my house). The kinds of stations you can have in your course are endless. Just be sure that everything is safe and age-appropriate. I suggest inviting the parents to help supervise, especially if you are going to have many kids over. Make the stations as physical as possible, so that everyone gets a good workout in! I always like to add a station that gives everyone a break, such as the "sit down for 5 minutes and drink a cup of water" station. I lay out a couple of bean bag chairs with towels on them to make a rest stop area. 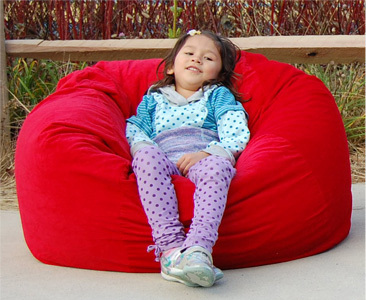 Use bean bag chairs with washable covers so you can throw them in the washing machine later. You can also put them on a tarp or big blanket. You would be surprised how hard it can be to get kids who are in the middle of running from one activity station to another to take a breather! The bean bags seem to make the rest area more inviting. Bean bag chairs outside make great rest stops. I use my smart phone to set up the alarms to tell everyone when to switch stations. What does your family like to do in the summertime? Do you have creative ideas? Please share, I'd love to add them to my summer activities!